We photographed a test run from the north end of Santa Cruz (N36o 57', W121o 05') to the mouth of the Salinas River (N36o 45', W121o 49'). This was a short run to test our equipment, such as the GPS interface for the camera and the Firewire connection to the computer. The camera and computer were operated on their internal batteries during this flight. 233 images in this flight. We picked up where we left off. Photographed from the mouth of the Salinas River (N36o 45', W121o 49') to Big Sur. This run was intended to test the fully packaged system, including the inverter which powers the camera and computer. The equipment worked well, but the weather did not cooperate. We encountered fog down near Big Sur but continued to photograph from underneath it. I did not expect the fog to be very detrimental to the photographs, but seeing the results it clearly was. We will recover this ground at a later date. 547 images in this flight. We resumed photographing where we had encountered the fog near Big Sur with the intention of making it all the way southeast to the edge of the restricted area around Vandenberg AFB. On the way, we encountered equipment problems -- a software configuration error on the Powerbook (processor cycling was turned on when running on external power) limited the frame rate of the camera to approximately one every 5 seconds. This severely limited the forward speed of the helicopter until I realized that the frame rate increased when the inverter was shut down (because processor cycling was turned off when running on batteries). Flew down the coast to Oceano, where we broke for lunch and refueled at the San Luis Obispo Airport. After lunch, we returned to Big Sur to again recover approximately 10 miles of rugged coastline at a higher altitude. 1,191 images in this flight. This was to be our first overnight trip. We have not wanted to stray far from home until we were sure of our equipment. Our goal was to spend two days photographing from the other side of Vandenberg AFB's restricted area to the Mexican Border. We waited for the right weather for our departure, not wanting to encounter the fog we had seen on our earlier excursion to Big Sur. We flew to Santa Barbara Airport in the morning and had lunch with an old friend. 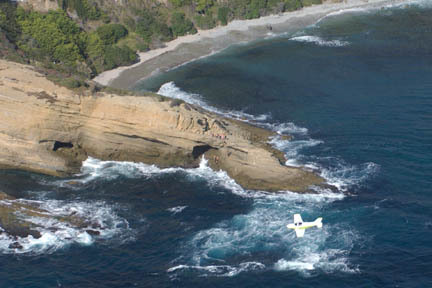 After lunch, we flew directly to Point Conception and started photographing southeast-bound. Naval Air Reserve Point Mugu was happy to let us transit their restricted area, but briefly sent us up to 1000ft to avoid a "live fire" exercise. After crossing Malibu, we doubled back and made a second pass at a higher altitude, photographing further inland and with less detail. Malibu is some of the prettiest and most threatend coast in Southern California. We stopped briefly as Santa Monica to refuel and continued southbound. Crossing Los Angeles International's Airspace, air traffic control sent us down to 150ft and let us transition along the shoreline underneath the departing jets. From Santa Monica we flew south, planning on stopping at Carlsbad Airport for the night and continuing to Mexico the next day. Mother Nature had other plans for us. We encountered fog approximately 20 miles north of Carlsbad, at around the San Onofre Nuclear Generating Station and quit for the day. 2438 images taken today, our biggest run ever. We spent the evening in a hotel room transferring the images from by Powerbook to an external Firewire drive to prepare the Powerbook for tomorrow's work. A total bust. The low fog never cleared from the coastline enough to continue our run to Mexico. We returned home empty-handed and will make another trip at a later date to complete Southern California. We flew to the Petaluma Airport in the early afternoon to refuel for our trip. We then headed west to the shoreline and started photographing southeast-bound along the shore from the middle of Bodega Bay. We continued our trip through Santa Cruz to the mouth of the Salinas River, reshooting Santa Cruz as the light was better than our first pass. Both sets of images are available online. We had planned a trip north later in the week, but a good forecast for the fog make us scramble to leave early. We stopped in Ukiah for fuel and lunch and then planned on spending the night in Crescent City. The north coast had unbelievably clear weather, so we decided to see how much we could get in before the sun set. We started at the Oregon Border and photographed as far south as Eureka before dusk, then returned to Crescent City to spend the night. The weather forecast called for no fog	as far south as Mendocino. The forecast was wrong. We were able to photograph a short strip around Eureka and another short strip around Shelter Cove, but otherwise returned home empty-handed. We will make a future trip to cover Eureka to Bodega Bay. Gabrielle and I spoke (with Mark Massara) about this project at the California and the World Ocean '02 conference in Santa Barbara on the evening of the 29th. A favorable forecast for the San Diego weather encouraged us to pack up our camera gear and take the helicopter down to Santa Barbara. The next morning Santa Barbara had a high overcast, but we were encouraged by the San Diego afternoon forecast and set out. Joining us for the ride was Ken Weiss, a staff writer for the Los Angeles Times who covers the environmental beat. Since I can't resist an opportunity, we re-photographed some areas of Santa Barbara, Malibu, and Los Angeles at a higher altitude and wider angle as we flew south. 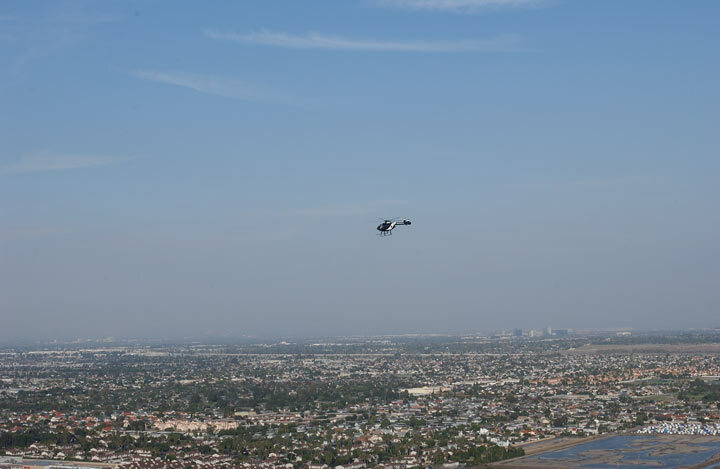 This time we were able to coordinate a transition with Los Angeles International that allowed us to take the photographs at our prefered altitude of 500ft. The Los Angeles weather was phenomenal; most of the smog had blown out to sea and downtown was visible in the background. We re-photographed Long Beach, which was almost invisible due to smog in our previous pass. Unfortunately, this time the Camp Pendleton Restricted Area was in use by military forces training to invade small oil-producing countries. 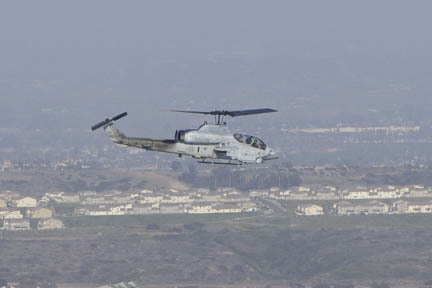 We passed over the Camp Pendleton Restricted Area at 2100 feet, photographing with a long lens. Although not optimal, we now had some photos of this area. The San Diego weather exceeded our expectations. It was clear with excellent visibility, and we had perfect cooperation from Lindbergh Field and the various military ATC controllers. We completed our coverage to the Mexican Border. We'd been watching the weather now for a few days and had gotten excited over the exceedingly clear coast of Northern California. Some personal commitments prevented us from making the trip earlier. 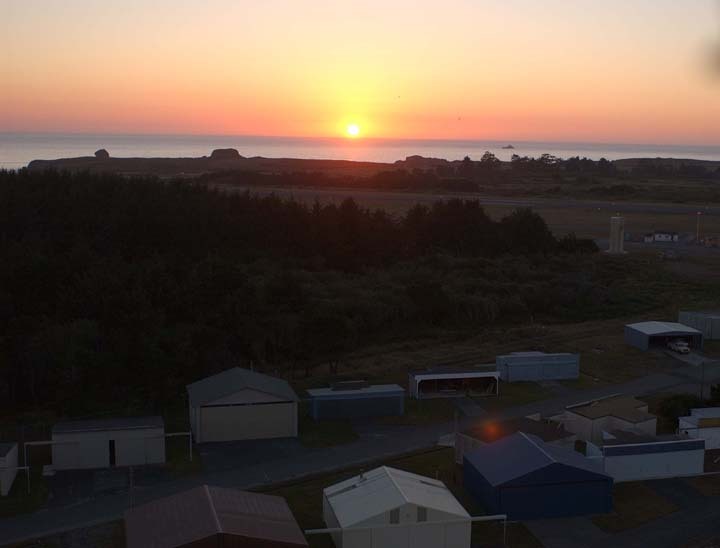 We awoke to a clear day with a forecast of no coastal stratus north of Point Arena, and were airborne by 8:30am on our way to close the remaining gap in our photography. We stopped in Ukiah, and then again in Eureka, for fuel. Departing Eureka we started photographing where we had left off and were able to continue as far south as Fort Bragg before encountering coastal fog which stopped us, so we continued on to Little River Airport for fuel, and then home. On the way home we reflected that this project gives a false sense of the California weather, because we only photograph on the clear days. This trip closed a significant gap in our coverage, and left the remainder of the North Coast well within a single day's trip. The coast of California isn't all sun. This photo was taken on our way home after we encountered the coastal fog. The first Pacific storm of the season blew through early this week and left clear weather and no fog behind it. We awoke to another beautiful day in California and confirmed it with a few web site visitors in the Mendocino area who had volunteered to be "weather lookouts" and roust us out of bed at the first sign of good weather. We departed Watsonville around 11:30am for Little River Airport on the Mendocino coast to pick up fuel and eat lunch. Departing Little River Airport we first flew north to Big River and photographed the estuary at the mouth. These photographs don't appear on the web site because we haven't figured out exactly how to present them (since they don't sort properly along the coastline). We continued up past Fort Bragg and resumed photographing where we had left off. From Fort Bragg we worked our way southeast-bound along the coastline, entering Tomales Bay just north of Point Reyes. Tomales Bay has many dunes and similar habitats, and given the wide mouth we decided to include it in the coastline. Unfortunately, on the way back out of the bay, we were facing west and into the sun. The photography of the western shore is quite poor; it is clear to us that there was no way to shoot both sides of the bay in the same visit and an early morning return visit will be needed to capture the western side. After reaching Point Reyes, we continued southeast-bound photographing from a higher altitude "overview" shots of areas that we had previously covered. We spent the afternoon of January 16th sight-seeing in the helicopter with some friends. On the west end of Santa Cruz we came across a huge crane parked on West Cliff Drive that appeared to be building a seawall. We returned with the door off and camera in hand to extensively photograph the operation. But first we made a pass along that stretch of coast to add to the website. Area in 1983, Copyright © Airphoto Designs. Before new seawall construction, September 30, 2002 (from Image 6583). Seawall under construction, January 17, 2003 (from Image 13208). We're not happy with the quality of some of our early work covering Monterey through Big Sur and wanted to spend some time this year recovering these areas. Today we had a near-perfect forecast with clear skies and no fog in any of central California. We started reshooting at the mouth of the Salinas River intending to cover through at least Big Sur, but were forced by fog to stop around Carmel. However, as a consolation, we were able to capture this bulldozer on the beach. City of Carmel bulldozes State Beach, August 12, 2003 (Image 13899). This year we are planning on re-shooting the southern half of the state (south of N38 latitude). This will be our first "comparison" with our earlier work. Today was unexpectedly clear, so we cancelled our other plans and headed north, photographing southbound back to Watsonville. Big Sur is one of the hardest areas to photograph because the fog is so unpredictable and there are no airports in the area and hence no local weather reports. The weather north and south of Big Sur looked good today, and the satellite photographs of the coast were encouraging. We waited until shortly after noon for our departure to arrive in the area with optimal lighting. 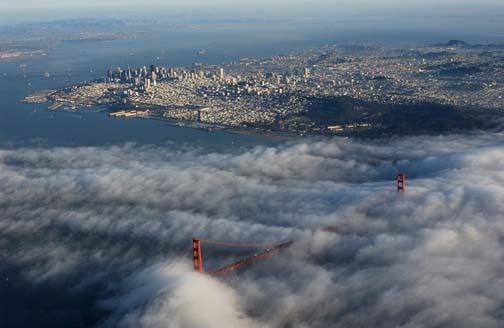 The fog was nowhere to be seen, and we took some spectacular photographs of the area, far better than our 2002 work. As we progressed southward near Oceano, there was some low haze that we tried to work with. Our coastal photography is usually squeezed between the summer coastal fog and the winter storms; the storms disturb the fog and give us the crystal-clear days we need. We awoke on October 23rd to an unexpected weather situation -- a storm arriving from the north dictated that if we were going to fly, we needed to leave immediately, yet the weather in southern California was too good to pass up. It was already raining in the San Francisco area when we departed for Santa Barbara, where we would fuel and change pilots prior to beginning our photography at Point Conception. We hastily packed for a few nights, not knowing where we were going to be staying or when the weather in the north would permit us to return home. The Amtrak Coast Starlight Train #14 travelling from Santa Barbara to San Luis Obispo and points north. Ironically, the Starlight was about to travel through the Vandenberg AFB that we have been unable to photograph. It is easy to forget that you are not alone in the sky. In addition to positioning the camera and navigating, the pilot must maintain a scan of the surrounding area for other traffic. This helicopter was travelling up-coast at our altitude on a apparent collision course when we spotted him and began an avoidance maneuver. Almost as soon as we began maneuvering, he also turned, to pass well clear of us. Camp Pendleton has a long restricted area that we were forced to fly over in 2002, but they weren't using it this weekend and were able to accomodate our request to photograph in it. As we arrived further south, a fog layer was forming above us that impacted the quality of the pictures. We continued on, hoping that it was a local phenomenom and didn't exist further south, but it did, and we ran out of light before reaching the Mexican Border. I curse the late summer fog. We awoke to hear the story that the Broad Beach Homeowner's Association, with unprecedented audacity, bulldozed the wet sand public beach onto private property, thereby destroying over a mile of beach habitat and creating a six-foot high berm of sand that prevented the public from having safe access to the public part of the beach. 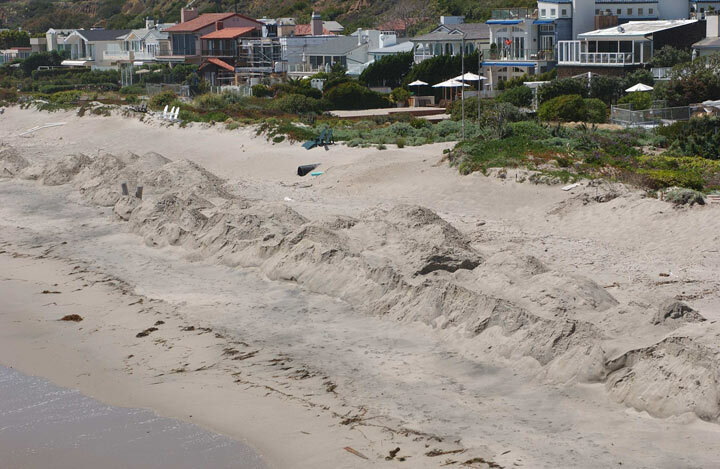 Ironically, the movement of this sand moved the high-tide waterline inward, thereby moving the public beach closer to the back yards of their homes. Not wanting to pass at the opportunity to document this destruction, we decided to spend the day testing the integration of our camera and computer equipment with our new helicopter by rephotographing this area. We were flying our helicopter up to The Sea Ranch for a short vacation and decided to take advantage of the morning light to photograph two west-facing views; Año Nuevo Island and the west shore of Tomales Bay. Tomales Bay had been covered before in 2002, but we did not have the opportunity to cover the west shore during the morning hours that cast the good light on the counter-facing coast. Año Nuevo Island was not covered as part of our original photography for similar reasons. We had planned on photographing from Point Arena south when we returned, but the fog did not cooperate. Our goal for 2005 was to update the northern half of California. The best weather is found in October and November; after the fog and before the winter storms. As we entered October, we prepared the helicopter to leave on short notice. We kept it outfitted with the survival gear, overnight bags, camera and computer equipment. There was a weak front that passed through during the first few days of October. This created an off-shore flow that gave us a few fog-free days. Our objective was to fly up to the Oregon Border and start photographing southward as far as we could make it. We awoke Tuesday, October 4th, to a crystal-clear day and a forecast of some high clouds in the Crescent City area, scrambled out the door, and arrived in Crescent City (last gas before Oregon) around 12:30. The high clouds had dissipated before our arrival, and we started shooting at the Oregon Border around 1:10pm. Unlike the weather problems we had in 2002, Mother Nature was fully cooperating. We stopped in Eureka for fuel, and continued as far as Gualala before quitting due to failing light around 4:40. After a quick gas stop, we headed home. Wednesday morning we awoke to the same clear weather, and could not pass up the opportunity. We flew back up to Gualala and from there photographed non-stop to the Pajaro River. Never before had we had such good weather. We completed our goal for 2005 in only two days. 6331 stunning photographs. The month of October was spent experimenting with our new Nikon D2x (12.4 Mp). Although we had already completed our goal for re-covering Northern California for 2005, we wanted to test the new camera in an area close to home. We resumed photographing at the mouth of Pajaro River and ended near Oceano at the start of the Vandenberg AFB's Restricted Area. The new routine of stopping periodically to change flash cards worked out well; it slows us down a little, but the faster cycle time allows the helicopter to fly faster between swaps. The clear weather was not only good for our purposes, but enticed a lot of other pilots to go flying. 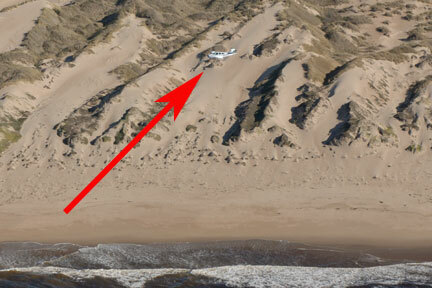 We passed this Bonanza just south of Oceano Airport. Our goal for 2006 was to photograph from Point Conception south to the Mexican Border. We were waiting for the fall Santa Ana winds to clear the Los Angeles air, but a good-visibility day arrived. We hurriedly packed in case we were spending an overnight out, and were airborne by 10:30am. After refueling at Lompoc we made our bumpy way over the coastal hills and started our photography at Pt. Conception lighthouse. The advantage of shooting during a weekend was that military airspace was more easily accessable. Normally Vandenberg AFB's airspace above 500 feet in this area was closed to us, but today it was "cold" and we could shoot the Goleta coast at an altitude more appropriate to the terrain. Further south, Camp Pendleton let us through their coastal airspace at an altitude of our choosing. The clear air brought out some recreational flyers and working aircraft. We passed this plane just north of Dana Point. 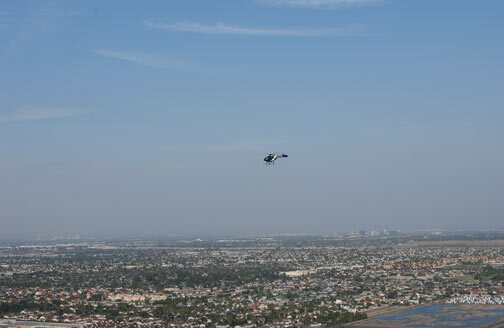 And this helicopter near Oceanside Airport. Haze in the San Diego area made this a one-day mission, and we flew home watching a sunset made blood-red by the ash from a forest fire north of Los Angeles. We had been checking the weather each day we were available to fly since our last mission, but every time the fog would be somewhere in the forecast. Finally a clear day showed up about the time we had other business in Southern California, so we flew south a day early. The weather was the best we'd ever seen, allowing us to rephotograph some areas we'd been unable to cover since 2002. 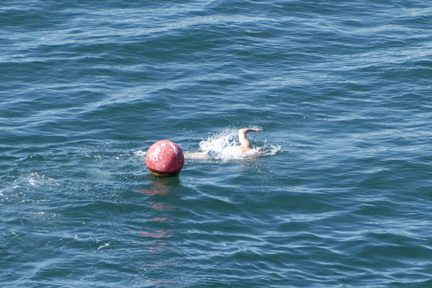 A swimmer enjoying the sunny day. After many days of fog, we were happy to read a report of clear weather in Southern California. We started as close to Point Conception as the restricted airspace around Vandenberg AFB would allow us, and made it to the edge of Long Beach Harbor when both the failing light and the long flying day made it a good point to stop. We had given up on bringing overnight bags with us several years ago as San Diego inevitably clouded up the day after we shot LA, but in this case we had to fly home from Torrance (the nearest airport to our stopping-point) one evening and fly right back down the next morning, as it was just as clear as the first day. All this trekking over the Grapevine proved worth it, however, as the fog held off perfectly. After a few days of fog and rest, we started on what we thought would be another perfect day, to shoot the portions of the coast closer to home. Problematic Big Sur behaved itself, Morro Bay was sparkling clear, and as we turned the corner past Diablo Canyon, we thought our perfect weather luck would carry us right to the northern edge of Vandenberg AFB's airspace; but, ten miles short of our goal, a few wisps of fog quickly became a solid bank completely obscuring the coast. An unexpected break in a week of fog came, and we headed up north. The fog indeed did not appear, but a high overcast gathered through the day and make the light somewhat flatter than we prefer. The first rainfall of the season was predicted in a few days, so we were glad to finish our 2008 shooting season when we did. The fog in the Northern Coast was beginning to hold off, so we readied the helicopter for a quick departure and kept an overnight bag handy. Finally a forecast of clear weather came when we had plans we could cancel, and off we went. After a fuel stop in Ukiah, we continued north to Crescent City, where we would fuel, switch pilots, and remove the door. But as we approached the coast diagonally, what looked like fog seemed to lie in the distance. As we crossed the last hills, we saw to our disappointment that there was indeed fog, but as we proceeded closer to Crescent City, we could see that it was low and thin, and might burn off with the heat of the afternoon. We ate a slow lunch on the ground, and then took off. The fog was mostly gone, but where it still lingered, it produced few annoying gaps in the coverage that were too small and too far away to reasonably reshoot. We had a visit planned in Santa Rosa the next day, so we stayed up north that night; but the next day, the fog returned for what looked like a few days, and we decided to head home after our visit. Another good weather report, this one accurate, drew us back north. The new camera works amazingly fast, especially compared to what we had to work with in our first efforts, and often the helicopter flew at full speed down the coast, the camera easily keeping up. Some issues with the power tethering meant we had to use the camera's own batteries, but they had plenty of capacity. Winds of 40 kts made the first part of this segment challenging; at slow speeds the helicopter is not stable enough for photography, so we scooted along, sometimes too fast for the camera, necessitating an occasional turn back. But the weather was perfectly clear, and the winds calmed down around Santa Cruz. After a summer of little sun, we were surprised to hear a prediction of calm, fogless days for most of the coast. After hurriedly packing for an overnight stay, we headed for the southern edge of Vandenberg AFB's airspace and refueled at Santa Ynez, expecting to refuel again in Torrance and shoot as far south as Orange County. But the faster flying made possible by the new camera is also more fuel-efficient, so we refueled in Oceanside, still with plenty of reserves. Just before touching down, we saw this giant steam generator making its slow way up the beach to the San Onofre Nuclear Generating Station. 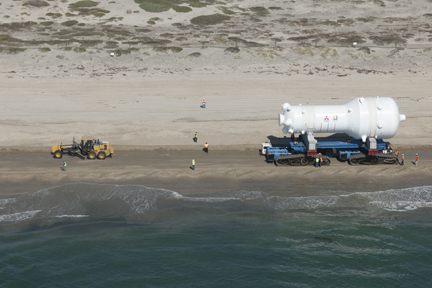 A 640-ton steam generator on its way to the San Onofre Nuclear Generating Station. Camp Pendleton's airspace was closed due to a high volume of training (this carrier was just outside the restricted airspace); but otherwise, the airspace was open and fog-free clear down to the Mexican border, which we reached with lots of daylight remaining. After refueling again in Oceanside and Santa Ynez, we made our way home under the light of a full moon. 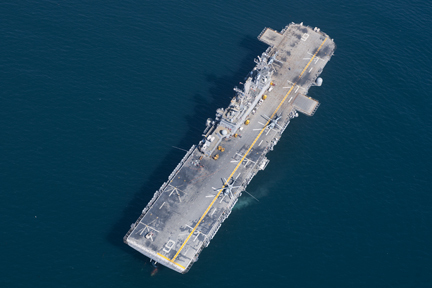 This carrier was just outside the Camp Pendleton restricted airspace. Nine hours of flying made us sleep in the next day; but we managed to resume flying in the afternoon, still not encountering fog south of the Pajaro River and north of Vandenberg AFB. Our refueling stop was at Oceano, where neither of us had ever landed before. The astonishing weather held for the third day, when we finished the final, northern segment, having shot this section of coast in less elapsed time than ever before. We had bought a new Nikon D800E the previous winter, motivated in part by another photography project that required its exceptional low-light performance. 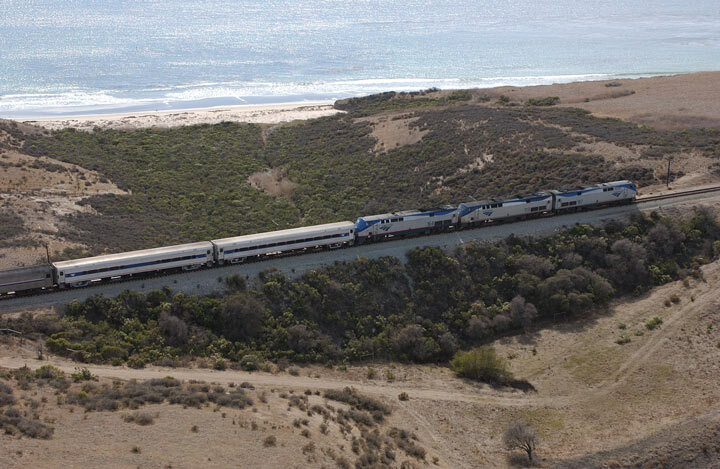 Test runs between Davenport and the Salinas River in the spring of 2013 had shown that its quick cycle time would also be a big advantage; but we had not anticipated how much that would speed the coastal photography experience. We had departed north with a forecast of fairly good weather that worsened closer to Oregon; we had decided to go as close to the Oregon border as we could, with the idea of returning later to fill in the gaps when the weather had improved. For once the reports were worse than the actual, and we found ourselves headed north from a fuel stop at Little River around midday with nothing more than a thin cirrus layer to dim the perfect sunshine. To our very great satisfaction, the Nikon was able to keep up with the helicopter at full speed, even when we shot the coast in finer detail, as we like to do when there are many structures in the frame. The usual northwesterly wind pushed up our speed to over 120 knots, and still we shot with only rare stops to change flash cards or camera batteries. Normally the light would force us to stop photographing around 4pm, but the September sun remained strong enough for the more capable sensors until a little after 5pm, allowing us to cover even a little more than the northern half of the coast (now Oregon to the Golden Gate in our reckoning) in a single day. We were elated. Giddy from our previous success, we had planned on continuing our northern coverage down to Oceano (about 180 miles) but an exceptional forecast further south caused us to reconsider, and, still a bit stiff and tired by our eight hours' flying two days previous, headed down to Lompoc. Refueled, we started at Point Conception and found that our previous experience was now the new normal: at 3pm we had shot clear to the Mexican border, and was able to return home before twilight had completely turned to night. Completing the entire coast (a feat we had only done once, at the beginning of the project) could easily be accomplished during the next clear day; back in 2002 it had taken eleven days over six months. No wonder we had decided at the time to only update half of the coast every year. Strong winds the previous night had knocked down trees and cut power throughout the Bay Area, but they also cleared out all the fog and haze from the coast and left us with a beautiful day to fly. We arrived at Año Nuevo island at noon, ideal time to photograph a landmark that we needed to circle completely. Winds throughout were all over the map, from dead calm through 15 knots both head and tail wind on the same route. A fuel stop at Marina Airport, close to the coast, is all we needed to complete our 2013 photography, stopping a mere .01 miles north of the Vandenberg Restricted Area. On this flight we didn't even allow 15 minutes for lunch, but kept our two stops to a minimum, and arrived home in time for an early dinner. Statewide oppressively hot weather was just beginning to break when we decided to shoot the coast near home and south to the edge of the Vandenberg Restricted Area. Of course there was no fog in the forecast (else we would not have chosen to fly), and of course there was fog north of Santa Cruz, just south of Monterey, and wisps down to Big Sur. We were very close to aborting the flight due to the fog; we decided that if there were one more fog bank south of Point Sur we would abort, but indeed there was none. There was, however, an odd thickening overcast (also not in the forecast) that seemed part smoke and part low clouds. The flat light was not our favorite form of illumination, but it did allow a better view of some sections of north-facing coast, such as the north face of Morro Rock. To reward our perserverance, on the way home, the few areas of Monterey that we had had to skip were out in brilliant sunshine, so we doubled back to shoot this section, which are stitched back into the sequence. This was an odd day for the weather; we dipped in and out of a strong inversion layer, with temperatures rapidly varying from 17 C to 32 C. The only other aircraft we saw were a bizjet departing from Monterey, and a low-flying biplane that had just taken off from Oceano Airport.